Your shot process is not over when the bowstring is released. It is important to follow through after the shot by holding your bow arm steady and allowing the tension in your release arm to pull your release hand back over your rear shoulder. For serious bowhunters, there is no downtime. Twenty-five years ago, on a cold January evening, I stood on a shooting line in a small indoor archery club and shot my first target round. I was petrified. Being a bowhunter from Mississippi, I hadn’t shot much other than paper plates in the backyard. Yet, there I was shooting my first target for a score. I went on to shoot a group any sawed-off shotgun would be proud of. Seriously, I wish I still had that target so I could show you; it was that bad! But that’s OK, because it reinforced why I was there in the first place. I was there to get better. Using the off-season to grow yourself as an archer is something every bowhunter should embrace. It’s a simple commitment that requires minimal investment but yields maximum return. In this article, I want to plant a few seeds you can gradually water throughout the off-season to grow yourself into a better bowhunter! One of the best things to work on during these winter months is acclimation. This is the key to overcoming one of bowhunting’s biggest hurdles. Every fall, I am fortunate to spend time in multiple hunting camps, and I never fail to witness “buck fever” get the best of fellow bowhunters. I suffered from it for years, and until I identified it and made an effort to be comfortable with it, I didn’t have much success in the field. At its most basic level, buck fever is a form of performance anxiety. The spike in your heart rate, adrenaline surging through your veins and massive antlers in front of you somehow cause you to forget everything you thought you knew about shooting a bow. More than likely, the end result is an errant shot and yet another story of the one that got away. I’ve been there. It’s awful. But there is hope, and I am living proof! The key to beating buck fever is learning to be comfortable with it. Comfort comes from acclimating yourself to the moment of truth. Much like jumping into a cold lake, it’s nerve-wracking at first. But soon you are swimming around invigorated. I started acclimating myself to buck fever the day I stepped onto that indoor archery range I mentioned earlier. I learned shooting in a competition — and having something at stake — creates pressure and tests your nerves. It might not be exactly the same as having a big buck in front of your treestand, but it is very close. 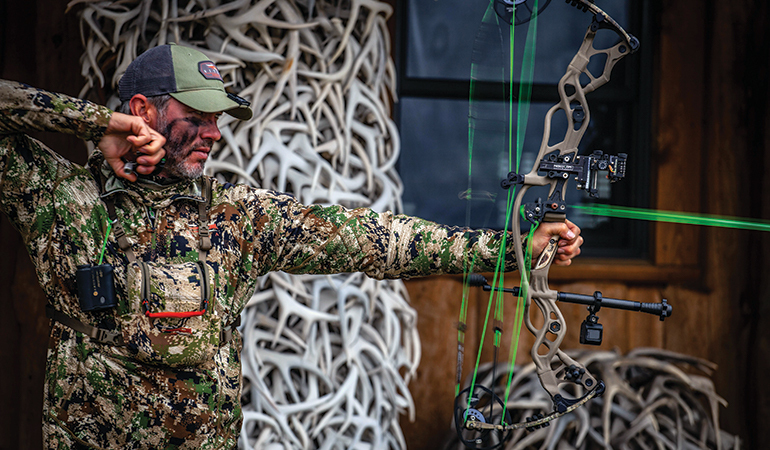 The archers who learn to effectively deal with the nerves of competition become great bowhunters. They have ice water in their veins and rarely miss an opportunity. Using this winter to get involved with some local leagues should be your first step. I remember feeling anxious each time I stood next to another person on league night and each time we walked down range to score our arrows. It was intense when I started, and most likely it will be for you, too. As I got better and was lucky enough to make a shoot-off or have to go head-to-head to break a tie, I would feel those nerves kicking in just like when I was drawing back on a buck; same shakes, same pounding in my chest and the same feeling of wanting to rush the shot. But the more I competed, those feeling occurred less and less, as though I was building a callous that shielded me from the intensity of the situation. When this happens, you are making progress as a bowhunter because your resistance to buck fever is building. Again, this happens from subjecting yourself to high-pressure situations over and over. The mind and body adapt and get used to it. When I was at my best as a target archer, I was competing constantly. That year, hunting was the easiest of my life because it was just another walk in the park. I want you to commit to finding a place where you can practice with something at stake. Shoot with people who make you uncomfortable or nervous. Tell yourself going in that you are there to acclimate and any progression should be considered success. Seek out opportunities to shoot when something is on the line and continuously strive to beat your old scores. This is your first step to growing. There is a critical component to shooting that will both help control your emotions and boost your accuracy. This is one of the most overlooked aspects of archery and bowhunting. It is simply focusing on a process. The process I’m referring to is a simple, systematic routine to walk you through the fundamentals of making a good archery shot. This serves two purposes. The first is that it helps engrain the core points of technique. The second is that it helps keep your conscious thoughts focused on making that perfect shot rather than blowing it. Years ago, as a competitor, I learned a valuable lesson that if you are consciously thinking about steps or processes then it doesn’t allow your mind to get distracted with negative thoughts or nervousness. I give each of my students some basic fundamentals to think about on every shot. Anchoring your release hand is a critical step. Depending on your release aid type, your anchor position can vary. If you have a handheld release, you want your index finger under your jaw line and your middle finger above your jawline. If you have a wrist-strap or index-finger release, then your index-finger knuckle should be at the base of the earlobe. As a quick reference, you can search YouTube for “mastering the release aid” and find a video I did for Petersen’s BOWHUNTING last year showing the proper anchor positions with either style release. Looking through your peep sight is so important and something that must be done last. The reason being is that the peep sight position can vary if the front shoulder or anchor is wrong. When your shoulder is forward/down and your anchor solid, then the peep should have the front sight perfectly centered once the string is at the tip of the nose. If any of these steps are incorrect then the string might be on the side of the nose and the peep will be closer to the eye. When each of these steps is done correctly, the shooter is in a very good posture, will have good technique and the arrow will be free of obstructions on the face. Take a look at the accompanying photo. Notice how, when each of the five steps are done correctly, they force the archer into a perfect T formation. From there, you are all set to move into the final step, which is actually a subject of its own. If you want to boost your accuracy, you need to put off-season effort into finishing the shot. If you only take away one thing I have written, this is arguably the most important. I’ve seen it firsthand from the best tournament archers in the world, as well as the best bowhunters. Time after time, I see archers make their shot and then immediately quit everything to watch the arrow. It’s a common mistake and is directly related to a hit or miss. Remember that just because the shot happened, that doesn’t mean it’s done. When an archer triggers the release and tries to watch the arrow, they commonly miss the mark because their front sight/rear sight alignment is instantaneously falling apart as the release hand is dropping down and away from the face. Remember, an arrow isn’t a bullet. It’s not that fast and is on the bowstring long enough that your follow-through has an impact on accuracy. The off-season is a great time to learn new skills such as how to tune your own bow or build your own arrows. The more you understand all your bowhunting equipment and how it works, the more likely you will be to notice any problems that arise and make quick fixes in the field. Another common problem is when shooters try to just “lock in” to their anchor and remain very static in their pull as they focus intently on aiming the pin and hitting the trigger. Being static on the bowstring is the No. 1 reason why people impact high of the target because they are creeping forward as they hit the trigger. “Creeping” results in high hits. Both of these reasons are why I teach students step No. 6 — pull through and finish. Once you are looking through the peep and the pin is floating on the target, do your best to stabilize the pin movement, even though it may not be perfectly steady, and continue to build gradual pressure on the string and trigger until the shot happens with a surprise. As soon as that shot breaks, focus on the FOLLOW-THROUGH by bringing the release hand straight back over the rear shoulder. You will be amazed at how much this helps reduce your left-to-right variations as well. As a bowhunter, I film myself a lot, and when I’ve made mistakes as the shooter, it is often clear that I “quit the shot” as soon as it went off rather than pulling through the shot and finishing with the release hand over the shoulder. The results will be clear to you! Another great investment to make in the off-season is simply learning to work on some of your own equipment. This is important for multiple reasons, and I really encourage people to get gear knowledge — even if they have a great archery shop close by. You will gain confidence in what you are doing and be less likely to blame your gear if you are in a slump. You can make quick fixes in the field in case there’s ever an equipment failure. Learning your gear better lets you troubleshoot things in the field and naturally keeps you more conscious of the little things that can cost you a perfect hit on a big buck. For example, if you learn how to properly fletch your own arrows, you are more likely to notice if a vane is hanging off or installed incorrectly. For those who want to grow your off-season gear knowledge, I do lots of DIY equipment videos on my Nock On Archery YouTube channel. I do these because I know how much it helped me improve my archery and want to pass this on. 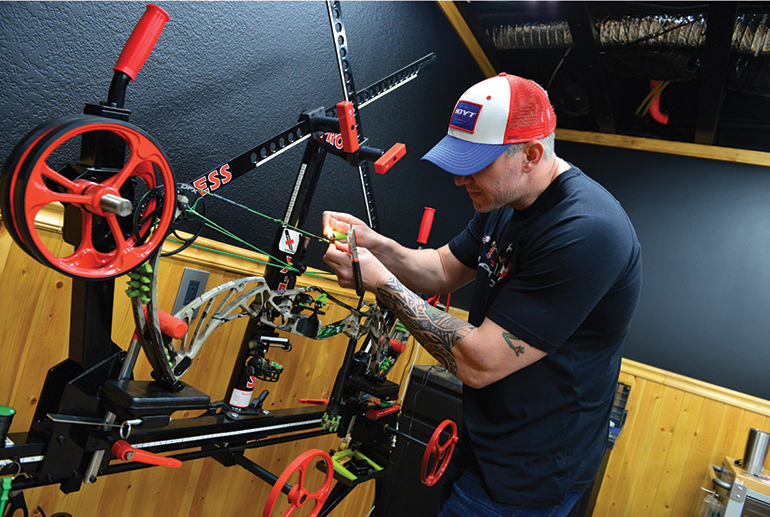 Although you may learn something by reading a great article here, I want you to take it a step further and dive into some hands-on skills such as tying in a peep sight or fletching your arrows. If you don’t feel like you can do it on your own, ask your local pro shop to let you help on a few simple things. Watering your thirst to learn is a great way of growing your success.